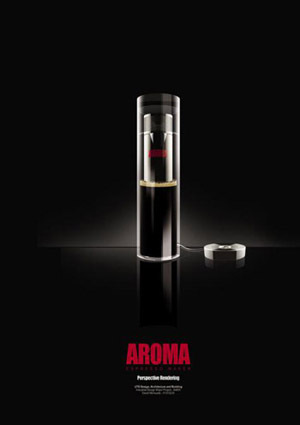 Aroma Espresso Maker, to be carried in your bag | OhGizmo! Yet another yet-to-be-released product, whose beauty and added functionality would make it a crime not to post about. It’s a gorgeous espresso machine designed by David Mansueto. It is meant to be carried around with you, only to be plugged in at your convenience. It makes 60ml batches of espresso, right before your eyes. David seems very excited about it. “From an aesthetic point of view it plays with your desires. It’s not just a coffee maker. There’s something very personal about it that makes you want to show it to someone and say ‘look what I’ve got. It’s MY coffee machine.’??? I would agree. I too would show it off, just so, if only I could buy one. Alas, David has just finished design school, and has yet to find someone to market this for him. I, for one, wish him the best.